Liberty Bottleworks bottles are sure to turn heads. But there’s much more to this story than meets the eye. Liberty Bottleworks makes the only metal water bottle Made in the USA through and through. The founders of Liberty Bottleworks, Tim Andis and Ryan Clark, have poured their hearts and souls into figuring out how to make their product from recycled and recyclable materials using eco-friendly manufacturing processes. Even the equipment is American made. Located in Yakima, Washington, the team at Liberty Bottleworks has created a zero waste factory that re-uses it own scraps to make more bottles. The bold, graphical designs are commissioned by American artists and rendered through a proprietary digital printing process that delivers high-resolution imagery that doesn’t just look striking—it actually feels textured. From the laces on a baseball to the bark of a tree, the picture on the bottle comes to life in a uniquely tactile way. Liberty Bottleworks is as thoughtful about its engineering as it is about its manufacturing and design. The deep drawn Aluminum construction inhibits dents while the non-toxic, BPA-free food grade coating prevents chipping and protects against leaching and bacteria build up. The quarter turn click top is designed for easy on and off convenience. And, the gradually tapered neck mimics the shape of a wine bottle to minimize splash and deliver a smooth pour. Every ounce of these bottles is brimming with American spirit, ingenuity, and artistry, making water more refreshing than ever. 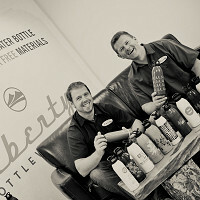 Liberty Bottleworks here… Creators of the world's only US made, sustainable water bottles! 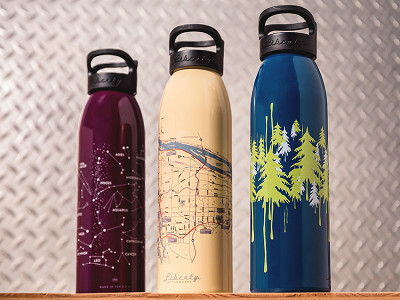 It's time to drink from a safe, healthy, American made, good looking water bottle. We're here to answer any questions. Let's talk! What are the caps made of? Are the bottles/caps dishwasher safe? You can always find this type of information in the details portion when you click into the box that says "buy". We recommend hand washing this bottle. Aaron from The Grommet here. The caps are made of non-leaching, food-grade polypropylene. They are 100% BPA-free and free of phthalates. Do the kids size bottles come with the sport cap? @Rachel Hey Rachel! Henry from Liberty Bottles. Our kids size bottles do come with sports caps. Sorry if this is redundant but how many ounces do these bottles hold. Thank You in advance. No problem - be sure to always check our details tab when you click into the box that says "buy", you can always find this type of info there. It holds 16 oz. @Amy It says 24 oz. in the details section for Artisan bottles. Which is correct? Apologies for the confusion there. The 16 oz bottle is the kid's bottle and the other 2 bottles hold 24 oz. Does this company employ illegal immigrants to work in their facility? @Diane No we are a small family and friend run operation with around 50 employees. 35% of our employees are veterans and everyone has their appropriate legalization status. The only thing missing is a handle on the side (like on a coffee cup) to hold it when drinking from it. The pain and weakness in my hands due to arthritis makes it very difficult to grasp a bottle of its diameter. 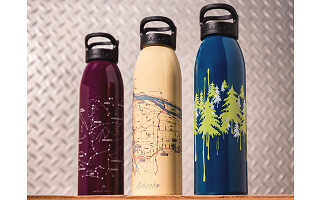 Is the teal bottle with tree design called Taiga? Are these bottles double walled for insulation to stay cold longer? The bottles are double lined, but not double walled. They stay cold longer than most single walled bottles and longer than glass. At the current cost, why don't the adult bottles come with the sport cap? The Regular Cap and the Sports Cap actually are the same price. For our offering, we wanted to provide the Regular Cap as we felt it provides the better solution for everyday, carry it everywhere use. Liberty Bottleworks bottles are sure to turn heads. But there’s much more to this story than meets the eye. Liberty Bottleworks makes the only metal water bottle Made in the USA through and through. The founders of Liberty Bottleworks, Tim Andis and Ryan Clark, have poured their hearts and souls into figuring out how to make their product from recycled and recyclable materials using eco-friendly manufacturing processes. Even the equipment is American made. Located in Yakima, Washington, the team at Liberty Bottleworks has created a zero waste factory that re-uses it own scraps to make more bottles. The bold, graphical designs are commissioned by American artists and rendered through a proprietary digital printing process that delivers high-resolution imagery that doesn’t just look striking—it actually feels textured. From the laces on a baseball to the bark of a tree, the picture on the bottle comes to life in a uniquely tactile way. Liberty Bottleworks is as thoughtful about its engineering as it is about its manufacturing and design. The deep drawn Aluminum construction inhibits dents while the non-toxic, BPA-free food grade coating prevents chipping and protects against leaching and bacteria build up. The quarter turn click top is designed for easy on and off convenience. And, the gradually tapered neck mimics the shape of a wine bottle to minimize splash and deliver a smooth pour.